So, last week I was in the throws of a really neat design idea. I’m a member of Christi’s Neighborhood and our project theme last month was called “Once Upon a Time.” Thoroughly inspired by the theme, I played around with the idea for several weeks before it formulated in my mind … Rumpelstinltskin. While not one my favorite fairytales, and not really a “classic,” the Grimm Brothers tale certainly does inspire my imagination. Wheat spun to gold, an impish like fellow, three wishes (in the newer versions), and always willing to bargain … yep. I’ll take it. But there was a problem. I didn’t want to do a standard “image transfer” as I wanted my signage to look like a pen and ink drawing. Even though I knew that an image transfer would work, it just wasn’t what I was going for…so I decided to try something new. NOTE: I do NOT recommend using Mod Podge as a “sealant” for your clay designs. If you want a good list of sealers, head over to The Blue Bottle Tree and read her article on sealers. First print your image onto plain white copy paper. I used Hammermill White, 20Lb weight. You may want to print your image in multiple sizes if you don’t know what size you will need. To help adhere the ink to the paper, I used my heat gun for about 1 minute on both the front and the back to help prevent smearing. First, using a synthetic paint brush, quickly place one thin coat of Mod Podge Hard Coat over the printed images. Wait a few minutes for it to dry. NOTE: If you do not wait for the first thin coat to dry, you will begin to smear the ink from your designs. Repeat by adding a second, thicker layer over the images. Use your heat gun to completely dry & set the mod podge. Be sure to do this on both the front AND the back as paper is porous. Repeat the exact same procedure as above on the back of the images (the non printed side). Take a small dab of Fimo Deco Gel and place it onto a piece of wax paper or printer label backs (see my article on these here). Using a different small synthetic brush, apply one thin coat of Fimo Deco Gel on top of the sealed images. Use your heat gun to completely cure the layer of liquid clay (deco gel). If you did a thin layer, this should take only a few minutes. Add another thin layer of Fimo Deco Gel on top of the first cured layer. Again, heat with heat gun to seal. Cut out your images using sharp scissors. The images are now ready to use directly on your clay. After your sheet is fully conditioned, use your finger and place a some TLS onto the wrong side of your image. Place the image onto your smooth clay surface, design side up. 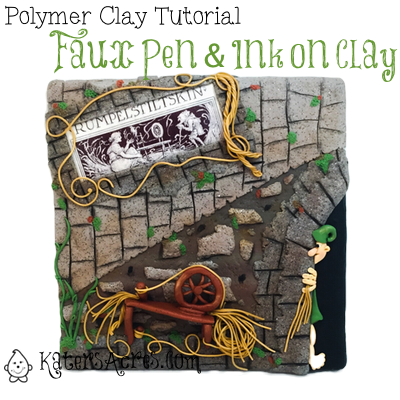 Use a brayer or acrylic rod to smooth down onto the clay. Place polymer clay around the edges of the image to hold into place. Before baking, add a thick coat of Fimo Deco Gel and bake your piece according to the manufacturer’s instructions. on your social media accounts. Do you have ideas for another tutorial you’d like me to post here on the blog? Send me your ideas. Hi Kate. Looks really interesting, well worth a try. Thanks. You’re more than welcome Lorraine! Thanks for letting me know you enjoyed it!